Karl-Theodor zu Guttenberg reappeared on the German scene this past week. He gave the editor in chief of the weekly newspaper Die Zeit, Giovanni di Lorenzo, a three-day interview that is to be published next week as a book, Vorest gescheitert (Failed - for the time being). A portion of the interview was published online, a longer version with nice pictures was published in this week's Zeit. I must admit to having be extremely angry when I read the interview. di Lorenzo so often quits asking questions on sensitive topics and switches to other topics, such as if he is going to start a new party and when he will be coming back. zu Guttenberg does not admit to having plagiarized, but keeps coming up with excuses. He had over 80 diskettes, and 4 computers, and 2 kids, and this and that and another excuse and this and that and I was really scatterbrained and and and and. He just does not understand why plagiarism is a problem for science - the only thing we have is our credibility. If we lie or steal, we are no longer reliable. If we pretend to be authors of something that is from someone else, we are liars. Luckily, the rest of the press pretty much heaped scorn on zu Guttenberg. The best one was a faked interview in the Süddeutsche Zeitung about zu Guttenberg looking like the soccer player Lothar Matthäus, with answers that Guttenberg gave di Giovanni. If you understand German, you will enjoy this interview. One hopes that he returns to the US and finds something useful to do for society. I don't think, however, that writing another dissertation in the US will be a good idea for him to try. Maybe he can learn a useful trade. The case of Dutch social psychologist Diederik Stapel from the University of Tilburg has made headlines in many countries. I just want to make a short note so that the articles are linked here. He fabricated data on a large scale for several dozen publications, including Science, so that the data better fit what he wanted to prove. The Science article, published in April of this year, has not yet been retracted. But the editors have added links to articles about the fraud. Stapel seems to have often offered colleagues "data" that fit their hypotheses, thus being listed as co-author. They now have to deal with the retractions. Six young researchers were the whistleblowers in the case, apparently some tenured professors had felt something was wrong, but did not have the courage to act on their instincts. Case 11: Arne Heller, a lawyer in Hamburg, submitted a dissertation on managing boards. He is currently applying for a habilitation, the second doctorate necessary for a university professorship in Germany. 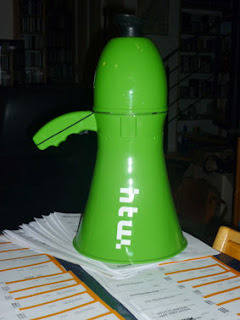 There was a nasty spat that ensued over an article in Die Zeit accusing VroniPlag of letting itself be instrumentalized by unknown persons from the University of Hamburg using VroniPlag to subvert the habilitation process. Heller has, however, already passed Chatzimarkakis with the amount of plagiarism (72% of the pages) and is not too far behind the gold standard, zu Guttenberg (94% of the pages). Many VroniPlag activists joined the fight on the comments page, which run to 39 pages at the time this blog post is being written. Case 12: Martin Winkels submitted a dissertation on the Ostpolitik that has plagiarism on 24% of the pages. Since he is neither a politician or well known, there was a longish discussion about whether the name should be made public or not. The VroniPlag group voted that since a thesis is published, it is fair to discuss it and its author. The vote was not unanimous, however. Case 13: Daniel Volk, Member of the German Parliament for the FDP. His thesis on international law is currently at just over 20% of the pages plagiarized. He insists to the press that nothing is wrong with his dissertation. The Charité is holdling a symposium in Berlin on October 7, 2011: "Responsible conduct of research in academic medicine: From neglect to action plan"
The Friedrich-Ebert-Stiftung will be holding a conference on October 11, 2011 about quality assurance at university that is said to be streamed on "Plagiatsfälle in der Wissenschaft -Wie lässt sich Qualitätssicherung an Hochschulen verbessern?" The DFG is said to be having a conference the end of November, I don't have a prospectus yet. I have been invited to speak at many gatherings, and have been asked to attend a parliamentary committee meeting as an expert witness. Both the Green party and the SPD have prepared motions about academic misconduct that they are planning on presenting to parliament. I will try and report on as many of these as possible so that non-German speakers can see what is happening. This blog has reported a number of times on what I term fake or write-only publishers (1 - 2 - 3). I am happy to report that German university libraries are fighting back - they are trying to avoid purchasing expensive rubbish. 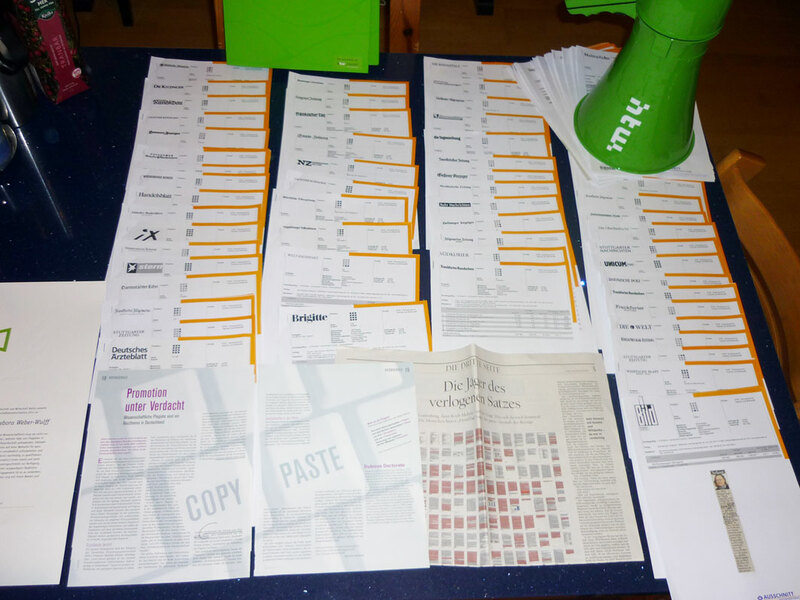 The Süddeutsche Zeitung reports that after some libraries realized that they were purchasing printed copies of material from the Wikipeida or dodgy bachelor's theses at outrageous prices, they have begun only purchasing the books - often badly produced print-on-demand volumes - with the possibility of returning the book. And they are keeping lists of the subpublishers that are springing up to disguise who is really behind the publishers. If a book is to be ordered from such a publisher, the librarians are asking back if the person ordering the book is aware of the common practices of these publishers. Hopefully, more and more libraries will realize that these are not legitimate publishers, and quit ordering books from them. Thanks to C.W. for the linklist! The Stuttgarter Zeitung (via dpa) reports that Jan Hendrik Schön has lost his Dr. for good. Schön, a physicist and shooting star in research, was awarded a doctorate 1998 from the University of Konstanz in the German state of Baden-Württemberg. He moved to a large research organization (Bell Labs) in the US and began producing amazing results in the area of nanotechnolgy - at times publishing one paper every 8 days. 17 papers were published in Science and Nature, before it was discovered that he was fabricating data. The University of Konstanz was so angered by this - and the ensuing public debate about scientific misconduct - that his doctorate was revoked in 2004. It was not revoked on the grounds that his doctorate was false, but on the basis of a state law that provides for revocation on grounds of "dishonorable conduct". There was some controversy about his, because the law was used in the Third Reich to strip doctorates from Jewish scientists. Schön sued the university and won, and the university appealed to the state court. They overturned the ruling of the lower court, and since this is a state law, no appeal to the federal court is possible. The doctorate remains rescinded. It was a long, long process, but it is good to know that the courts are upholding decisions taken by the universities. It will be interesting to see if this has any relevance for the other cases in which doctorates were rescinded on the basis of plagiarism, and the former doctorate holders suing the universities. The German business daily newspaper Handelsblatt reports on the case of Bruno Frey, a well-known economics professor in Zürich. There had been a bit of fuss in July when colleagues discovered that he had published four papers about the sinking of the Titanic with co-authors Benno Torgler and David Savage without mentioning that pretty much the same papers had already been published elsewhere. The texts were not identical, but the research was, and each paper suggests that it is the only one presenting the results. The "Journal of Economic Perspectives" (JEP) has formally censured him, the "Journal of Economic Behaviour and Organization" (JEBO) has blacklisted the authors and will not accept any further papers from them. Frey and Torgler have said that Savage is not at fault and have tendered excuses at 3 of the 4 journals [German language detail: The article says that they "excused themselves", I always thought you had to ask the other party to excuse you --dww]. Apparently, Frey had not gotten around to writing to the "Proceedings of the National Academy of Sciences" (PNAS) before the Handelsblatt started its investigations. The whole issue seems to have started with the blog Economic Logic and an entry entitled "On the ethics of research cloning". The author of the blog had a good look at the CVs of the senior authors and finds evidence both of slicing results very thin in order to get much publication mileage out of them, as well as republishing the same results multiple times. In the comments a number of other clones showed up, and a FreyPlagWiki (the currently popular German way to collect evidence on scientific misconduct and plagiarism) was set up. Interesting things have popped up, such as Frey exempting his doctoral students from coursework now required by the University in Zürich, or his being dropped from an editorial board without explaination, according to a followup blog entry. The Handelsblatt author Olaf Storbeck has set up a Google Table documenting the cloning in 5 papers - it would be great if this and FreyPlagWiki were unified. It is a wiki, after all. Update: "Ich habe mich zu wenig selbst zitiert"
Hermann Horstkotte reports on Spiegel Online about a strange plagiarism case. A young woman was working on her doctorate in law at the RWTH Aachen. Since there is no law faculty there, she had to submit her doctorate to the University of Bonn. But she did not submit until after she came back from an extended maternity leave. Her professor in Aachen sent his glowing expertise on her thesis to the Bonn colleague, who, while reading the thesis, discovered that he had read that before. Indeed, the colleague from Aachen had published another volume of his "Handbuch für Europarecht" during her maternity leave. 40 pages of this volume are identical to the thesis submitted. Now we have the chicken and the egg problem: did the professor take the text from his doctoral student? Did she take the text from the handbook? Did both write the text together? Aachen investigated the case and determined, that they could not determine who was the original author. They note that the professor should have noticed in his expertise that there was a large portion that matched his recent book. He agrees that this is a lapse on his part. The University of Bonn now has to decide how to proceed with the case. The Nature blog reports that the new Turkish Minister of Education, Ömer Dinçer, lost his title of professor in 2005 on the basis of plagiarism in a textbook published in his name. Turkish Council of Higher Education took back his professorship title, and Dinçer lost his legal appeals case. But on July 8, 2011, the Turkish Council of Higher Education cleared him, and on July 13 he was appointed Minister of Education. Nature spoke with the council, which confirmed that they had withdrawn the charge of plagiarism, but refused to elaborate. Since this is a publicly available textbook, I would hope that Turkish academics can quickly set up a wiki and document the extent of the alleged plagiarism, in order to let the public judge for themselves how extensive the copying is. Without exception, the works, ideas and thoughts of others is to be shown the necessary respect by use of appropriate forms of textual layout. Every word-for-word use must be set between quotation marks. Even for paraphrase or summary instead of word-for-word use, appropriate denotation is to be given. In paraphrase or summary, care must be taken not to attribute to the authors something they did not state. Translations of texts in foreign languages are to be denoted with reference to the original source. If the translation is not word for word, it must be marked as such. If someone else's translation is used, this too is to be noted. General knowledge need not be cited. Self-plagiarism is not scientific misconduct per se, but every effort should be taken to give the source and note the extent of the use. It is a clear case of scientific misconduct to use a ghostwriter. This is also the case, even if you have permission to use the text. Authorship is not just a right, but also carries a responsibility. Substantial portions of work denote authorship. On the other hand, no one can claim authorship who has not done a substantial part of the work. Honorary authorship, hierarchical authorship, leadership authorship or authorship on the basis of obtaining resources are clear cases of scientific misconduct. The assessment of dissertations will be done by the mentors will take these rules into consideration and will make sure that they are followed. The assessments of dissertations must state whether and how it was made sure that these rules were followed. It is obligatory to determine if the texts delivered for assessment follow the rules. The assessors must note what measures they have taken to ensure this. Good luck with that, this is one step in the right direction! If you read German, the blog de plagio has a thorough discussion of the use of titles in IDs in Germany. The author does not see this as useful, as people will continue to use it on their business cards. The author insists that people who lose their titles must automatically lose any public office. I'm definitely in on that one! The German University of Münster announced on July 14, 2011 that they have rescinded a doctorate from the medical faculty. A Wikipedia editor reports on a strange occurrence while researching an article about growth factors in prostate cancer in the Wikipedia Kurier from May 28, 2011. The editor was using a dissertation from 2006 as the basis for the Wikipedia article. Dissertations - the non-plagiarized ones - are very useful for this task, as they offer a succinct overview of the literature on the topic. The editor stumbled over the term Xxxxxxxxx xxxxxxxxxxxx xxxxxx something s/he had not heard before. It was references from a book from 1996. Instead of running to the library to get the book, the editor first asked the "all-knowing garbage heap" if there was anything on this term around. The editor was amazed to find a dissertation from 2009 on the same topic from the same university. The university puts all of its dissertations online, so only a click was necessary to download it. A short read was, as Yogi Berri would have put it, "déjà vu all over again". The editor thought this might just be a typo on the downloads page and that s/he now had two copies of the same dissertation. But no, each was by a different author. Since zu Guttenberg had just recently resigned and VroniPlag was under full steam investigating other dissertations, the editor began a side-by-side comparison. Except for minor (and sometime error-inducing) changes, the general introduction to the topic was identical, down to the the line breaks. Then it got worse: there were even identical results, discussions, and the dedication - except the names were changed. The CVs were, however, different. The editor was not sure what to do, consulted with some scientists. The unanimous opinion was: this must be reported to the authorities. So it happened, and the doctorate has been rightly rescinded from a practicing medical doctor in Westphalia. I have often stated, as here in the Deutsche Ärzteblatt, that we need two kinds of doctorates for medicine: M.D. for the practicing doctors and Dr. med. for the researchers. I'm glad the University of Münster was so quick in reacting. By the time Sezen received a Ph.D. degree in chemistry in 2005, under the supervision of Sames, her fraudulent activity had reached a crescendo, according to the reports. Specifically, the reports detail how Sezen logged into NMR spectrometry equipment under the name of at least one former Sames group member, then merged NMR data and used correction fluid to create fake spectra showing her desired reaction products. Correction fluid? I thought that state-of-the-art fakes used Photoshop these days. "Dr. Mohamed El Naschie is pseudoscientist crackpot who makes grandiose claims about being a "paradigm-shifting" high-energy physicist. He also claims that he deserves the Nobel Prize several times over, and has been nominated for it, but that it has been denied him because he's Egyptian, Muslim, and named Mohamed. He does not tolerate criticism and has earned a reputation as a legal bully. El Naschie is the founder of a nonsense theory of "fractal Cantorian space-time" that he calls "E-Infinity theory". By founding the Elsevier journal Chaos, Solitons and Fractals in 1991, and being its Editor-in-Chief, he managed to publish hundreds of numerological screeds disguised as real physics. As Editor-in-Chief, he was able to avoid peer review for himself, and to publish otherwise unpublishable papers for favored acolytes. In this way he attracted a dozen or so loyal followers, the "E-Infinity group" or "Brotherhood" as we call them on El Naschie Watch. The most famous, or infamous, member other than El Naschie himself is Prof. Ji-Huan He of Donghua University in Shanghai. Ji-Huan He has called El Naschie "The greatest scientist since Newton and Einstein". Another well-known member is Prof. Otto Rössler of the University of Tübingen, who made the news with warnings that the Large Hadron Collider at CERN might make a black hole that would swallow the Earth." Just when you think that the plagiarism scandal in Germany might be calming down, the next one shows up. It seems that people are learning how to spot plagiarism, and are finding far too much in the dissertations of plagiarists. The weekly newspaper Zeit reported on July 6, 2011 that unnamed researchers (not VroniPlag) had analyzed approximately half of the dissertation that Bernd Althusmann had submitted to the University of Potsdam in 2007. He is the minister of education in the German state of Lower Saxony and as such the current head of the Kultusministerkonferenz (State Conference on Media and Education). This is an organization that tries to coordinate education matters in the 16 federal states, that all have their own ideas of how to go about educating the general populace. The Zeit has posted an excellent list of plagiarisms and an analysis of the same. Prof. Volker Rieble, author of the book Wissenschaftsplagiat, has called for his immediate resignation. At least the University of Tübingen rescinded the doctorate of Matthias Pröfrock, state politician in Baden-Württemberg, yesterday. Jorgo Chatzimarkis, German representative in the EU for the FDP party, is currently being investigated for plagiarism in his dissertation. VroniPlag has him currently listed at 70%. He was on a TV talk show on Sunday, for whatever reason, trying to defend himself by redefining the rules of what good scientific practice is, in order to "prove" that his thesis is okay. It was quite a bizarre show, as he evaded direct questions, the talkmaster Anne Will asked leading questions that presupposed the correct answer. There was a guy with a "von" in his name and a journalist/blogger, and then Anke Domscheidt-Berg, standing up for VroniPlag. She had joined the chat the night before, spent a few hours asking questions, and understood quite a lot of what the group does and why. I just saw a tweet that Chatzimarkakis has now also resigned from the European research council - but I don't have verification on that yet. If you read German, there is a group blog called "de plagio" (a truely wonderful play on words, as you can read it as "Plagiarism in Germany" or "about plagiarism"). They liveblogged the appearance of Mr. Chatzimarkakis on a German talk show (Anne Will) this evening. He tried to defend himself on account of his "accusers" being anonymous. Anke Domscheidt-Berg did a great job of trying to explain to him what good scientific practice is and why what VroniPlag is doing is not judging him but documenting grave similarities between his thesis and much referenced but unquoted material (currently at 70% of the pages in his thesis). The show should be online in the "ARD Mediathek" for a week or so. The de plagio blog is well worth reading! Sylvana Koch-Mehrin had her doctorate rescinded by the University of Heidelberg for containing over 30% plagiarism in May 2011, and now in June she has been named EU commissioner for research, Spiegel Online reports. This means that she is in the committee that determines research policy for the EU. She had been an alternate for the committee, her fellow FDP politician, Jorgo Chatzimarkakis (his dissertation is currently at 71% plagiarism, but he is contesting the plans of the University in Bonn to rescind his doctorate as well) had the main seat. They have now changed places. What does this say about research in Germany? What message does this give to the general populace about the importance of research? Plagiarists determining research policy? If today was April 1 I would have considered this an April Fool's joke, but it is unfortunately true. Poor Germany, all of your good researchers do not deserve this. Update: A petition has been started requesting that she step down immediately. It is online in English, German, and French. If you feel so inclined, please sign. There are already almost 2000 signatures - on day 1 of the petition. 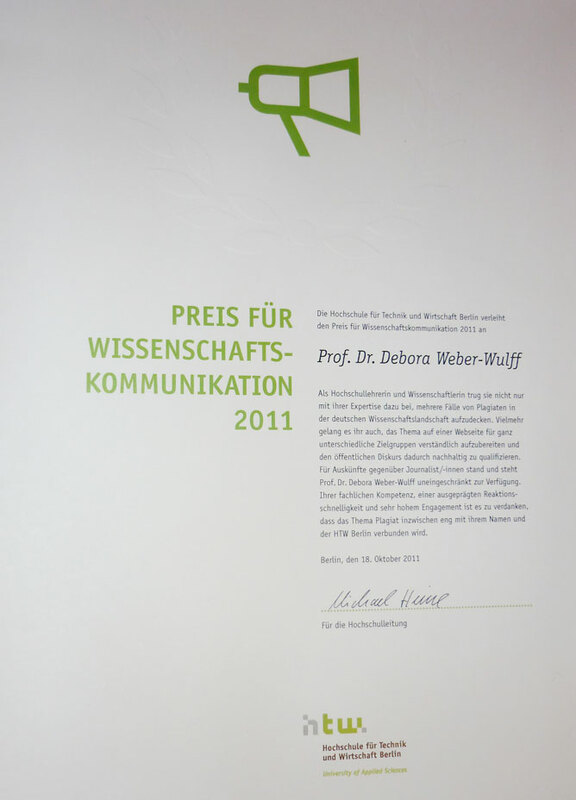 The GuttenPlag Wiki was awarded the Grimme Online Spezial Award 2011, a German journalism prize for it's work in determining the plagiarism in zu Guttenberg's thesis. At a time when great confusion reigned about how to assess the dissertation of Karl-Theodor zu Guttenberg, the "GuttenPlag Wiki" created clarity. In an unprecedented form of collaboration thousands of web users examined the thesis in detail and found discrepancies. Plagiarisms that were found were precisely documented in parallel with the original sources. An overview of the plagiarisms found was kept current on the first page of the wiki. This method of working produced excellent results in a very short time. The results are verifiable for anyone, making this web site a central contact point for the discussion about plagiarism in the dissertation that was conducted in the media and in the general populace for weeks on end. The fair and unbiased mode of operation used by the administrators of the wiki was outstanding, and channeled the onslaught of prospective users into constructive paths that delivered a sober overview of the findings. The public statements of Minister Guttenberg about his thesis were thus set in contrast to the facts that could be evaluated by anyone. Not only was the project idea of the initiators noteworthy, but also the hundreds of web users who found more and more passages online and offline, that were used in the thesis without proper attribution. The project makes it clear that text comparisons can be well-organized in a collaborative manner and shows the possibilities of the web in general for group work. Silvia Bulfone-Paus is an immunologist. She worked at the Forschungszentrum Borstel (FZB) outside of Hamburg in Germany, and is a professor at the Medical University in Lübeck. Laborjournal.de reports that she published many papers together with the Russian couple Elena Bulanova and Vadim Budagian from Russia. Retraction Watch reported in March 2011 that 12 papers by the three authors have been retracted. The three have published 22 papers together, so there may be more. In October 2009 the biologist Karin Wiebauer realized that the Western blots in some of the papers were very similar - sometimes just the labels were changed, in others a dose of Photoshop was used to mirror, move or distort the bands. This is the same method that Marion Brach used in the Hermann/Brach scandal end of the 90s [strangely enough, there is nothing in either Wikipedia about either them or the scandals]. 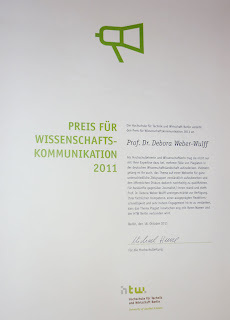 In November 2009 Wiebauer informed the first author, Bulfone-Paus, of her discovery. Nothing happened. Finally, in April 2010 an investigation committee was convened. They determined that there was just sloppy publication, but the results were okay. There was a culprit found - the Russian couple. They were accused of deceit and the 12 papers retracted, although the Russians did not agree to the retractions. Severe failure in one area (as supervisor and responsible senior, corresponding and first author) can hardly be compensated by merits in other areas. [...] For all scientists, one of the greatest goods in science is personal credibility and integrity, and that the most precious currency scientists have is the truthfulness of their data. The scientific community expects rigorous adherence to the rules of scientific research from principal investigators and, in particular, from heads of research divisions or departments. [...] The scientific misconduct in Silvia Bulfone-Paus's lab and her procrastination to go public despite being ultimately responsible has highly damaged the reputation of the Research Center. This is what cannot be tolerated. But now the plot thickens: An additional paper by Bulfone-Paus (not including the Russian couple) in Blood is currently under investigation. A co-author on this one is her husband, Ralf Paus, a dermatologist at the University of Lübeck. And the university has verified for Spiegel, a German news weekly, that they are currently investigating 6 papers of Paus. And now it appears that Bulfone-Paus and Paus both have professorships in Manchester, in England, where they spend 20% of their time, according to the Times Higher Education. The couple also have three children, as reported by Spiegel in January. In other news about Borstel, another director, Peter Zabel, stepped down earlier this month amidst plagiarism charges. It seems he double published a paper (once in German and once in English), as well as in 2009 publishing a paper that included large portions of text and diagrams from a 2008 paper published in the US. The double publication is deemed not so severe, although it is not clear that the later publication makes clear that it is in fact a double publication - the abstract has been rewritten, but is still similar. Zabel has now also resigned from the editorial board of Der Internist. The double publication was found by someone calling themselves Clare Francis, who informed Retraction Watch, Abnormal Science Blog, and me. It was found using the Déjà vu tool for searching for duplicate content in Medline. Joerg Zwirner, in a recent post to the Abnormal Science Blog, calls for setting up an Office for Research Integrity in Germany, as is to be found in the US. I heartily agree - this is far too complicated to understand for non-medical researchers, but it seems that there are deficiencies in the medical research complex in Germany that have existed for decades. And Hermann/Brach did not result in these being adequately addressed. Germany needs action, and it needs it now.